As they age, cats often suffer a decline in functioning, including their cognitive functioning. It’s estimated that cognitive decline-referred to as feline cognitive dysfunction, or FCD-affects more than 55% of cats aged 11 to 15 years and more than 80% of cats aged 16 to 20 years. Memory, ability to learn, awareness, and sight and hearing perception can all deteriorate in cats affected with FCD. This deterioration can cause disturbances in sleeping patterns, disorientation or reduced activity. It can make cats forget previously learned habits they once knew well, such as the location of the litter box or their food bowls. It can increase their anxiety and tendency to react aggressively. It can also change their social relationships with you and with other pets in your home. 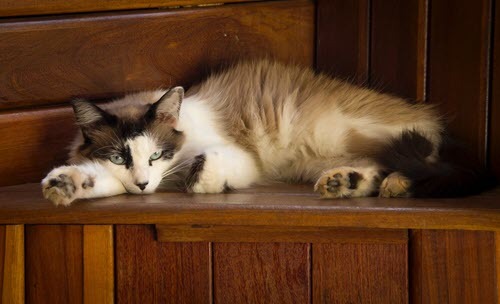 Understanding the changes your cat is undergoing can help you compassionately and effectively deal with behavior problems that may arise in her senior years. Some effects of aging aren’t related to cognitive dysfunction. Often these effects can contribute to behavior changes that only look like cognitive decline. Be sure to report all changes you see to your cat’s veterinarian. Don’t assume that your cat is “just getting old” and nothing can be done to help her. Many changes in behavior are signs of treatable medical disorders, and there are a variety of therapies that can comfort your cat and ease her symptoms, including any pain she might be experiencing. Less interested in petting, interactions, greeting people or familiar pets, etc. If your cat shows any of the symptoms or changes listed above, your first step is to take her to the veterinarian to determine whether there is a specific medical cause for her behavior. Any medical or degenerative illness that causes pain, discomfort or decreased mobility-such as arthritis, dental disease, thyroid dysfunction, cancer, impaired sight or hearing, or urinary tract disease-can lead to increased sensitivity and irritability, increased anxiety about being touched or approached, increased aggression (because your cat may choose to threaten and bite rather than move away), decreased responsiveness to your voice, reduced ability to adapt to change, and reduced ability to get to usual elimination areas. If medical problems are ruled out, and if primary behavior problems unrelated to aging are ruled out (for example, problems that started years before your cat began aging), your cat’s behavior may be attributed to the effects of aging on the brain. If cognitive dysfunction is the only logical explanation for changes in your cat’s behavior, the next step is to seek therapy. Treatment mainly consists of making helpful changes to your cat’s environment and keeping her daily schedule consistent. There are also some medicines that may help cats with FCD, such as selegiline hydrochloride (brand name Anipryl®). This drug is currently only licensed for use in dogs with cognitive dysfunction, but some behaviorists and veterinarians have reported improvement in cats as well.Your veterinarian may also consider an anti-anxiety medication. For a description of the different anti-anxiety medications used to help cats, please see our article, Behavioral Medications for Cats. Inappropriate elimination is a common symptom of FCD. In fact, it’s the most common reason that older cats are seen by behaviorists. Any number of medical problems can contribute to inappropriate elimination, including sensory decline, neuromuscular conditions that affect mobility, brain tumors, kidney dysfunction and endocrine system disorders. In short, any disorder that increases your cat’s frequency of elimination or decreases her bladder or bowel control can cause house soiling. Accordingly, the first step in treating inappropriate elimination in any cat, regardless of age, is to take her to her veterinarian for a thorough examination. Increase the number of litter boxes available to your cat. Place at least one litter box on every floor of your house in case your cat is having trouble going up or down stairs. Place additional litter boxes where they’re easy to find and easy to get into. Cats experiencing FCD may forget the location of their litter box. Make sure you keep the existing boxes in their same places, but put new boxes in obvious areas so that your cat can always find an appropriate place to eliminate. Use litter boxes with low sides. Many older cats have trouble or experience pain when attempting to get in or out of a litter box with high sides. Please see our article, Litter Box Problems, for additional suggestions and detailed information about resolving litter-box issues. Disorientation is often the first sign that pet parents recognize as cognitive decline in their older cats. It’s estimated that disorientation occurs in at least 40% of cats aged 17 years and older. Disorientation may be reduced by increasing the predictability of your cat’s environment and schedule. Avoid changes to her food, food placement, litter and litter box placement. Try to keep her daily routine as consistent as possible. If she’s really distressed, it may be best to confine her to a relatively small space, such as one floor of your house or, in advanced cases, one room. Doing this will make it easy for her to find everything she needs. A cat’s sleep-wake cycle can be impaired by FCD. However, as with most symptoms of FCD, there are also many alternative reasons for increased nighttime activity. For instance, cats who sleep more during the day can become more restless and active at night. Sensory changes, such as eyesight or hearing loss, can affect your cat’s depth of sleep. An increased need to eliminate combined with a decreased ability to locate or access a litter box can prompt your cat to wake up and wander around. Ask your cat’s veterinarian to do a complete examination to identify medical problems that could cause restlessness, discomfort or an increased need to eliminate. At the same time, try to reestablish your cat’s normal sleeping and waking hours. It’s best to increase her activity level by engaging her in play during the day and in the evening so she’ll want to sleep at night. Anxiety can also cause increased restlessness at night. A distinct feature of geriatric anxiety is that it can manifest as nighttime anxiety. It may be anxiety about being separated from family members (who are asleep) or worry about navigating the house in the dark. Your cat may keep you awake by calling, pacing in your room, purring by your head and by pawing at you for attention. FCD anxiety can improve with drug therapy. Please see our article, Behavioral Medications for Cats for more information. You can also consult a Certified Applied Animal Behaviorist (CAAB or ACAAB) and your veterinarian, or a veterinary behaviorist (Diplomate of the American College of Veterinary Behavior, Dip ACVB) to see if medication may be helpful. Older cats may vocalize excessively for a number of reasons, including disorientation, loss of hearing and pain due to one or more medical conditions. As with other symptoms of FCD, your first step should be to take your cat to her veterinarian for a thorough examination to rule out or treat any medical problems. FCD generally increases vocalizations related to anxiety, disorientation and separation distress. Anxious vocalizing is usually a plaintive meow. Your senior cat’s vocalizing can become a problem if she does it too often or at inappropriate times, like when you’re sleeping. Showing your own frustration or punishing your cat for vocalizing can increase her anxiety and aggravate the problem. It’s better to treat increased vocalization by increasing your cat’s activity during the day and gradually reestablishing her proper sleep-wake cycle. Pheromone or drug therapy may help your cat feel less anxious. You can use feline pheromone sprays or diffusers in areas where your cat normally spends her time. Please see our article, Pet Pheromones, for more information about pheromones and how they work. Anti-anxiety medication can also help reduce vocalizations. You can also seek advice from a Certified Applied Animal Behaviorist (CAAB or ACAAB) and your veterinarian, or a veterinary behaviorist (Diplomate of the American College of Veterinary Behavior, Dip ACVB).